When asked by a reporter — “What’s your favorite perfume?” — the Italian stage actress Eleonora Duse replied that such questions were “ridiculous and puerile.” 1 Duse avoided the press whenever possible and felt an actress “must not attract attention when she’s not on stage…an actress must pass through life unobserved.” 2 If Duse were alive and working today, I’m betting there would be no “Eleonora Duse” celebrity fragrance on the market. But it’s good, in the 21st century, to see or hear the name Eleonora Duse because she was such a cultural force in her lifetime. Laura Tonatto says Eleonora Duse (Eau de Parfum) is “an olfactory interpretation of the artistic personality and humanity of the great actress.” The fragrance contains bergamot, viola odorata (flowers and leaves), iris (whose powder used to be called ‘poudre de violette’), ylang-ylang, lily of the valley, mimosa, vanilla and cedar. Eleonora Duse starts with sweet citrus and violet flower, very harmonious, and a bit “formal.” Slowly, one detects violet leaf…not the brash violet leaf you’ll find in a zillion men’s department store scents, but a soft/“furry” violet leaf aroma that mingles with a dirty/earthy note. Eleonora Duse becomes powdery during the dry-down, and I detect a lovely iris powder note (not too sweet, not too smooth) that mixes with the lightest vanilla-wood accord imaginable. Eleonora Duse is an old-fashioned violet perfume that avoids stodginess; I think it would smell best worn in cool weather, but it’s so “quiet” it won’t overwhelm the wearer even on warm days. I love violets and enjoy the Eleonora Duse fragrance (its sillage is minimal, its lasting power good). Though the Eleonora Duse fragrance notes sound feminine, I have no qualms about wearing the perfume (and I do have qualms about distinctly feminine perfumes on my person). If you’d prefer a more sparkling, summery violet fragrance, I recommend (and hope to review soon) the lively Geo. F. Trumper Ajaccio Violets. Laura Tonatto’s Eleonora Duse fragrance rekindled my interest in a fascinating (and still inspirational) person. Duse wrote: “an actor vanishes without a trace.”6 She made only one short film— Cenere (Ashes) — watch it if you ever have the chance. I realized quickly the acting life was not for me, but the best parts of my years of training (losing my shyness, learning how to really read literature and look at art, nature, people) have stayed with me, made my life more interesting and enjoyable. Laura Tonatto Eleonora Duse Eau de Parfum is available in 100 ml for 72€; the fragrance is also sold as a “clothing fragrance”/home fragrance spray (called “Nottegiorno”), 250 ml for 27€. The Eleonora Duse bottle label shows Duse in a 1901 publicity still by Gio-Batta Sciutto from the Biblioteca e Museo Teatrale del Burcardo in Rome. For buying information see the listing for Laura Tonatto under Perfume Houses. To refresh my Duse knowledge, I read the wonderful book Eleonora Duse: A Biography by Helen Sheehy, Alfred A Knopf, 2003; notes: 1, p. 228; 2, p. 112; 3, p. 248; 4, p. 10; 5, p. 149; 6, p. 313. 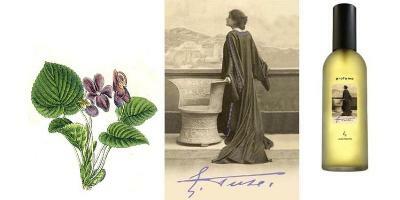 Note: top image of Eleonora Duse, circa 1893, by John Singer Sargent [cropped]; and top/center-left images of viola odorata [cropped] by Johann Georg Sturm from Deutschlands Flora in Abbildungen, 1796, via Wikimedia Commons. Your review was such a breath of fresh air, Kevin! One of your best yet. Thank you for introducing me to this woman and this fragrance which I now absolutely have to try – especially being a violet lover. I was just at a store and saw how many celebrity /”actresses” are the “face” for various clothes lines, beauty products, and on the cover of every fashion magazine. I know a woman like Ms. Duse would probably be relegated to the Independent world of film today but I would sure love a quiet spitfire like hers in cinema today. Actually, the closest person I can think of off the top of my head is the brilliant and very successful Maggie Smith – but even she had her days in the spotlight. Off to track down Duse’s biography. Thanks again, Kevin! Kevin – and if you haven’t already seen it, watch Ladies in Lavender with Maggie Smith and Judy Dench. It’s wonderful! Stella Adler? Wow. This is a most fascinating post. It is beautifully written and so interesting. I’m definitely going to get a sample of Duze. Cenere is on my ‘to see’ list now. I love and appreciate what said acting taught you. Wonderful review, and it sounds as if the company truly desired to create a fragrance to reflect, and honor The Great Duse. She truly had a memorable face … face is too blase a word. Visage. Lovely review, and this is, indeed, a beautiful scent. I keep meaning to do a comparison between it and AG La Violette. I’m glad you’ve seen Cenere–seemed as though she was in a different film from the rest of the eye-rolling, hair-pulling cast. Extremely moving. Francesca: she always had to contend with those types of actors…on stage too. I’m not a violet girl, so I probably won’t seek this out, but I do want to read her biography. I was unfamiliar with Duse, and this was a great introduction. I love biographies because I’m fascinated by how people live, and she sounds so interesting. Thanks, Kevin! Miss Kitty V: this bio is very very good..and has lots of Duse’s vivid writing in it too. and a scented candle is kind of a 3) – but it’s optional. The ceremony is required for sure. I adore violets. I was always in charge for violets when helping at my grandmother’s garden. In Apré L’Onde aniseed ruined violet note for me. Looking forward to Geo F. Trumper violet cologne review. Veronika: Thank you! Some time is required for this long review! The Ajaccio Violet is a great perfume…and very good for summer/hot climates. Kevin – Now I understand why I so enjoy reading your posts – there’s an artistic streak deep down in your soul! I can appreciate the wonderful enrichments that the theatrical trainings have given you, as someone who had once intended to have (what a surprise…) an operatic career. The personal benefits that we’ve obtained as a result really do enrich our lives and enhance our personalities, and the best part is that they stay with us for the rest of our lives. OperaFan: Ah…I sing opera too…with a voice that makes the crows and blue jays in my yard sound MELODIC in coparison! HA! I’m sure they celebrate when I simply crank up the volume on the CD player and stay mute myself. This violet is less “wet” than the Guerlain…a different “emotional” vibe to me. Curious how you’ll react to it. Kevin, you write such beautiful prose. I knew a little about Eleanora Duse, but now that you have enlightened me, I want to know even more about her. The fragrance also sounds like something I would like. Thanks so much for the wonderful read! Filomena: you’re welcome. I can’t believe there’s never been a filmed bio of Duse (that I know of anyway). It would be hard to cast, that’s for sure. EdnaFrau: thank you! You are right…the Tonatto scents are hard to come by…. Oh, I love this one! It was discontinued for awhile and just reappeared in the last couple months in her line-up, I’m assuming it’s the same but haven’t re-sniffed it. I liked it because it was rich (on my skin) without being too sweet or candied, or too powdery. It might be my favorite violet. I do like to layer it with Annick Goutal Violette that Francesca mentions. Kevin- thanks for the lovely review! A doozy! This has moved to the top of my must try list.- violet lover that I am. Helen…you wear your violette-love on your sleeve! Thanks for a beautiful review, Kevin. Both the fragrance and the biography are now on my ‘must-seek’ list! I’m not especially partial to violets, but your lovely review made me want to try this scent, in homage to Eleonora, if for no other reason! My acting training was brief (I was a model for about half a minute a long, long time ago) but I think it made me a better reader, teacher, and observer of others. Thank you for this thoughtful post! This was so beautifully written, Kevin! I love it when in the process of reading a review, I discover more about the writer! There are so many violets I have yet to try, and this sounds like a wonderful one. Jill: this one nudged out a few on the VioletLadder…this and Ajaccio are now my favorites. And for violet LEAF…love the Lutens Bois de Violette as well. I’ve never heard of this Duse woman, won’t read her bio, and won’t seek out the juice because it doesn’t sound like my kind of thing. But I just had to comment to tell you how much I enjoyed the review. Fascinating. Inisightful. Beautifully written. it’s a treat to learn new things while I explore what often feels like a trivial hobby. (Not that what you guys do is trivial – I just feel guilty for spending my free time reading NST over, let’s say, the Wall Street Journal). Sunski: one can’t just read the WSJ or the head will explode, right? Kevin, this is a great review! I loved learning about Eleonora, and about the etymology of the word “doozy”! Count me among the violet fans, so I will seek a sample of this. Right now, my favorite violet is Stephen Jones. Which surprised this aldehyde-phobe. Hi, Haunani: that’s one (of MANY) I’ve not tried. I’ll echo the other comments, Kevin and say thanks for the informative and evocative review! I do like violets, but they are a bit tricky: some are powdery to the point of stuffiness, and some go all the way to candied. My favorite violet, although I haven’t tried alllll of them, is Penhaligon’s, with Goutal’s second. I tend to like cedar, but did not care much for Bois de Violette – is there much “cologney” angle in E Duse? Mals86: I don’t find Duse “cologne-y” at all…it has great balance as it dries on skin…goes from moist and fresh to a tad dirty to dry/soft. I visited Warsaw around 1990, when the old Europe, frozen in time, could still be glimpsed. An old woman on the street sold charming, old-fashioned violet nosegays, the little bunch of violet flowers rimmed by violet leaves like green lace. Love your review, Kevin, and also appreciate ednafrau’s link to the Cenere clips – will definitely seek to sample this! nozknoz: what a lovely scent memory. Such a wonderful read! I felt the admiration you have for her in your words. Thank you so much. I learned about a little more than perfume from your review. I dont recall ever hearing much about her. I’ll have to take a look into her life’s tory and I’ll definitely be looking to get a sample. NaturalSelektion: Duse is one of the very very few actresses from her era who is still known. Even some of the great silent film acrtors are forgotten these days. So try E. Duse the perfume while IT lasts! HA! As for this scent: I’m a violet-lover and should try this. The room spray sounds like it might be really nice also. I’m a bit cautious of the powder, because I only rarely am in the mood for an old-fashioned powdery violet like Borsari. I like the sound of the green leaf and earthy notes, though. Lastly, I’m still always a bit surprised for some reason when you mention that you “have qualms about [wearing] distinctly feminine perfumes.” Enjoy your weekend. Joe: I know…and now I think of YOU when I say/write such a thing! HA! I just have never been comfortable in powerhouse feminine orientals…or BIG rose fragrances…and watch me faint if tuberose explodes on my body. Perhaps I need therapy? HA! I think the only reason it might surprise me is because I’m sure you mentioned wearing Montale Red Aoud to work, and to me, that is a thermonuclear ROSE-SAFFRON bomb. I mean, it’s not Nahema feminine, but it’s va-VOOM! Joe: trying to get me to remember a Montale? Impossible! Do they have 1000 fragrances now? I remember liking, was it, RED Vetyver? But if I did wear and love Red Oud I know that saffron tempers rose for me…and if you have a hunk ‘o labdanum/leather, saffron or cumin in a rose it takes it to a place I like. I think Paestum Rose is on the cusp for me…I wear it…but one more drop of rose and it would be unwearable…for ME. Kevin, what a fascinating piece. I, myself, trod the boards in my youth…”it is a shattering moment in a young person’s life when they realise:I shall never play the Dane”. Particular fascination re the origin of “Doozie” as I may have allegedly (trying to avoid any accusation of promoting anything commercial) been involved in the production of a wine that may (or may not) have been called that, and we were quite sure that the name related to a large motor car. And now I find it relates to a truly great actress which is much nicer, and before that, I beleive, to the English habit of calling anything regarded as excellent “a Daisy” which conveniently merged with Duse to give us Doozie. I wonder if the motor car in Driving Miss Daisy was a Duesenberg? Seraph: I don’t know! But it would be easy to find out since Driving Miss Daisy is on TV every. single. night. I’m sorry that I wasn’t on-line yesterday, and almost missed this. I always enjoy your reviews, Kevin, but this is some of your best writing yet. Excellent! Bravo!